If you think Spring, you think flowers. Ok, it may seem cliché, but it’s true. Warmer days are comin’ and flowers are bloomin’, and fashionistas want to dig out their liberty prints to be in line with the environment, it makes sense. After the dotted eyeliner trend (see further below), it’s time for flower (or floral) eyeliner to step onstage. 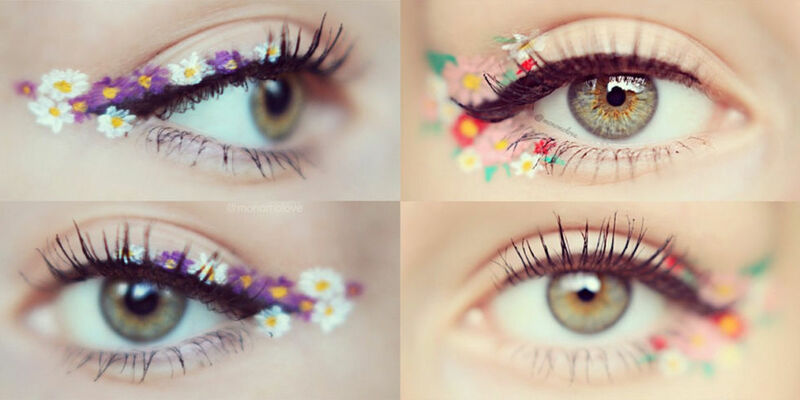 The theory is simple: draw little flowers as you would an eyeliner line, for a colourful garden result. Flower power! However as far as application goes we can’t guaranty anything. However many little daisies you drew on your notebooks in school, managing to trace flowers on your eyelid – the other way round too – can be more complicated than you’d hoped. We would recommend having a first go with a basic shape and max three colours. You can also use dots (and regroup with the dotted liner trend!). Let out the romantic in you! The floral eyeliner is the ideal bucolic trend. 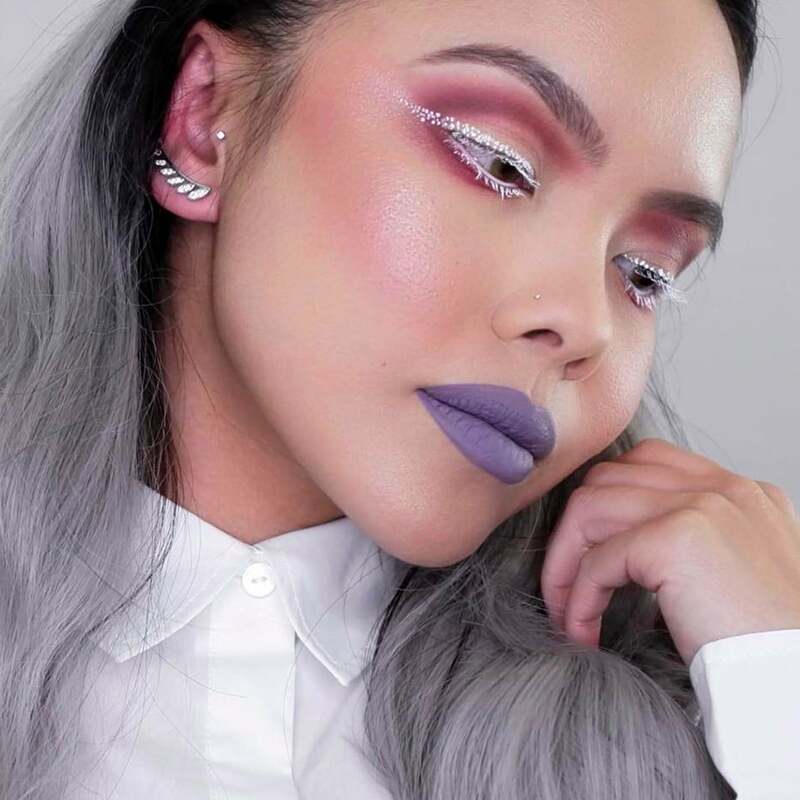 Whether you are good at it or not, the results can be fun and powerful, or delicate and minimalist, with the impression that all of the flora is bursting on Instagrammer’s lids… It does take a few minutes of course, but the result is original and at times so bluffing it’ll easily replace a basic black eyeliner drawing. So if you want to brighten your eye makeup – and your Instagram feed – in chic hippy 70s fashion, go for it! Remember. Beginning of 2017, quite a few pics popped up of the web and catwalks with eyes bearing black dots drawn with eyeliner. Let’s admit it’s a fresh, original, and seductive trend. To the point (get it?) where it now has its own hashtag #Dottedeyeliner (or #Dottedliner) and is all the rage on Instagram. Fashionistas and raising dots to a whole new height – the one of their eyelids, to be precise. And what better way to step away from the slender strokes of the eyeliner than to create bubbly looks with pretty dots. The Dotted Eyeliner consists of drawing a number of little dots – of your colour and size of choice – on the mobile eyelid, just above the lashes. Regroup them next to each other and they form a nice eye makeup. Some beauty bombs have, as you would with pointillism in painting, created real artistic compositions on their eyes! Drawing a perfect eyeliner line can be a challenge. But here, it’s a whole new stroke that even the clumsiest of us can adopt, by simply putting a few black dots above the lashes. The most skillful can play with colours and shapes to create a stunning optical effect. We love it! The Big Autumn No Nos! Theme Designed by Rohit. © 2019 yearblog.co.uk. All Rights Reserved.